These cards are perfect for young boys and teenagers. Our tutorial also includes a free printable template for you to download and keep! 1. With the red and pastel blue textured card, cut out two shapes to 7.5cm x 10.2cm. Cut one side of the blue card into one curve to create the body of one of your monsters. To create the body for the red monster, curve one side randomly. 2. Make eyes for your little monsters by die cutting the circles from the First Edition Flowers die set. We have die cut the largest circle with grey card, the white card for the white of the eye and then grey and black for the pupil. Layer the circles from biggest to smallest and stick to the monsters. 3. With a piece of 5.5cm x 2.7cm black cardstock, create the mouth for the red monster by cutting a curve into one side. Cut three tooth shapes and stick to the top of the black card and add to the centre of the red monster. With a 7cm x 1.5cm piece of grey card, cut a cheeky grin for your blue monster. Cut another tooth shape with white card and layer under the grin before sticking to the middle of the blue monster. 4. We have then create antennas for our red monster by die cutting two medium circles from the flowers die set with grey card and sticking onto two 0.3cm x 2cm pieces of grey card. Layer the antennas onto the back of the red monster at the top before sticking both characters to the card blank. 5. To finish, we have cut a strip of the green textured card to 15.4cm x 3.8cm and cut into the top of the card to create blades of grass. Stick to the bottom of the card using double sides tape. 1. Cut a piece of the First Edition Man Made city landscape paper into a 15.1cm square and stick to the centre of the 6” x 6” kraft card to create a frame effect for your card. 2. With the free template, cut out the controller with textured black cardstock and cut the two circles out with white card and stick to the controller. 3. Die cut a small red, blue, yellow and green circle from the First Edition Flower set and stick to the right circle using foam squares. 4. Following the template, cut out the cross with grey card and stick to the centre of the left circle. Cut out the two circles using red cardstock and add to the game controller between the buttons using foam squares. 5. With a piece of black foam and the template, cut out the cable for the game controller and stick one side under the game controller. Add the game controller to the card using foam tape and use double sided tape for the cable. 1. Cut the First Edition Man Made yellow park paper into a 15cm square and stick to the centre of the kraft card to create a border around the card. 2. We have then cut the balloon paper to 11.5cm x 12cm and stick to the centre right of the card. 3. Cut the multi-coloured dashed paper to 15.1cm x 4.1cm and cut the corners off one side to create a point. Cut out a fishtail design on the other side to create a error design and stick to the centre of the card. 4. Die cut the third biggest nesting stamp die with the cloud paper and add to the centre. 5. Stamp the balloon stamp onto the multi-coloured dashed paper and the orange repeat print. Once dry, cut to size and stick the orange balloon to the right of the nesting die. Overlap the other cut hot air balloon slight over the orange balloon with foam squares. 6. 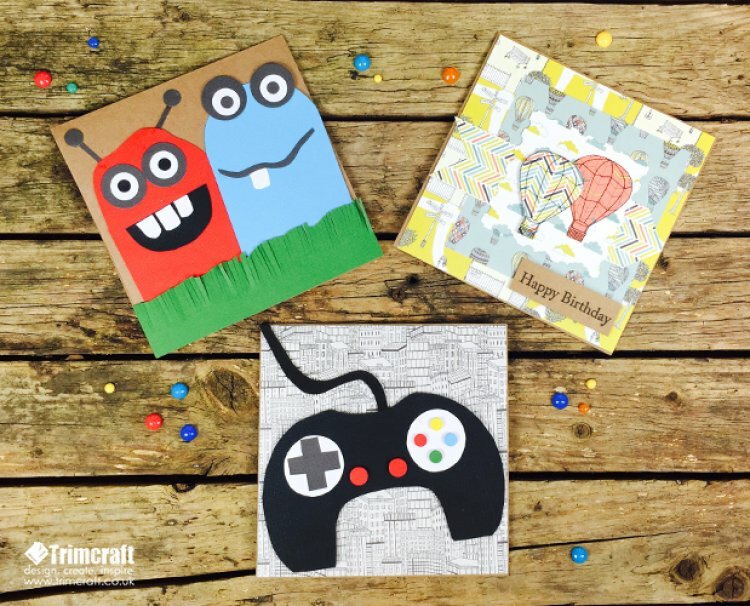 To finish, stamp the ‘Happy Birthday’ sentiment on a piece of another kraft card blank or a piece of kraft card. Once dry, cut into a 6.8cm x 2.2cm rectangle and add to the bottom right of the card using foam tape. We would love to see your recent cards for boys! Just share and upload them to the project gallery.